These cheese straws are crazy-delicious. 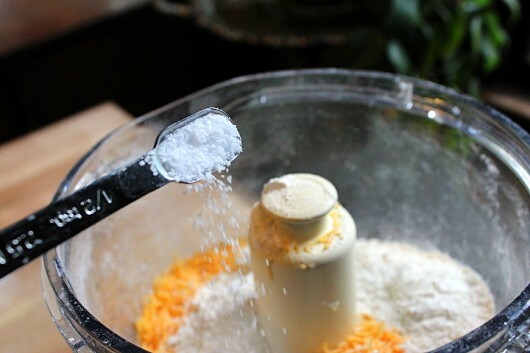 Think of elongated “Cheetos,” kissed by the sharp tang of real cheddar and the heavenly air of Herbes de Provence. Serve the straws at your next cocktail party, and watch them disappear. Or, just do as I did last night, and hog them all for yourself! 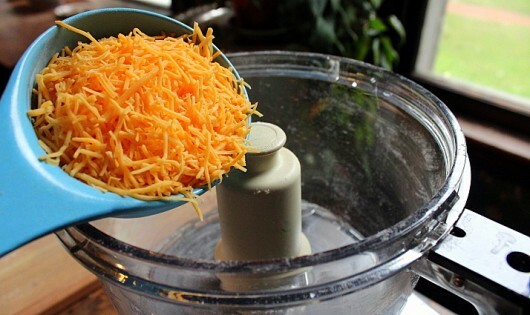 To start, tip 1 1/2 cups shredded, extra-sharp cheddar cheese into the bowl of a food processor. And 1/2 teaspoon crushed red pepper flakes. Pulse the machine a few times, just to break up the butter. And by the way, we are not alone in the kitchen. Lily the Dairy Queen is standing at our feet, hoping that one of us will accidentally-on-purpose drop some cheese on the floor. 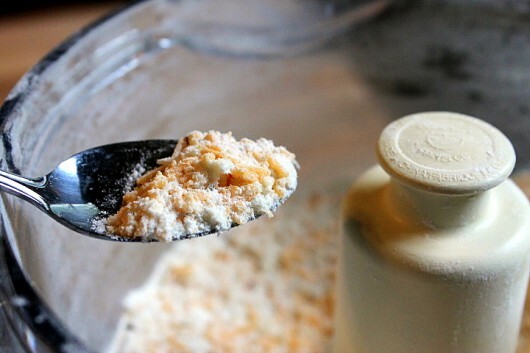 When properly pulsed, the mixture will look hopelessly dry and crumbly. 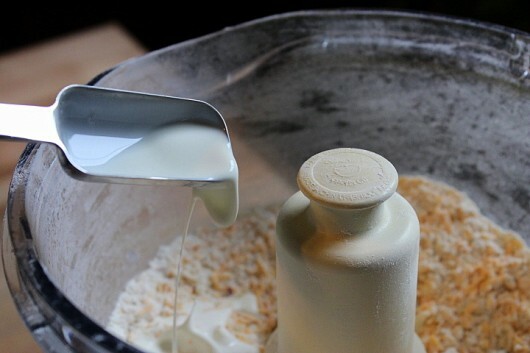 Now clutch your pearls and add 1 tablespoon heavy cream. Run the machine until the dough masses on the blade — 20-30 seconds. And that’s it — the dough is done! The dough is delicious even when raw. Don’t ask me how I know this. 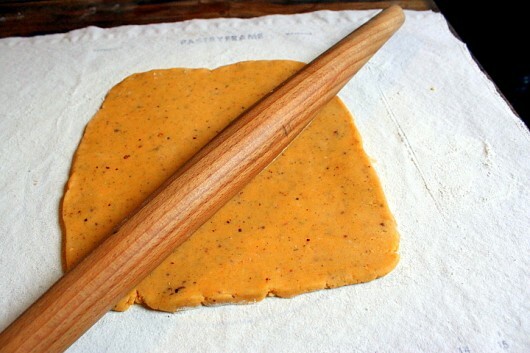 Dump the pastry onto a lightly floured surface, and roll it into a rough 8 x 10-inch rectangle, about 1/8-inch thick. 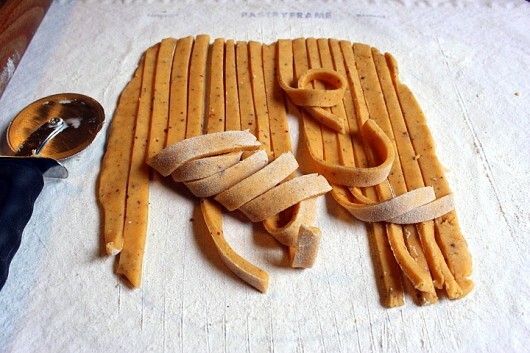 Then dip a pastry wheel or knife in some flour, and use it to cut the dough into 1/4-1/3-inch strips. You can make the strips as long or as short as you like. I prefer long strips, because they always look chic when arranged in a tall drinking glass. And pop them into a preheated 400°F oven. Bake until the ends of the pastries start to color — 12-15 minutes. Then transfer the baking sheet to a wire rack, and let cool to room temperature. For the best taste and texture, serve the straws on the same day you make them. And for a regal presentation, such as you would want for a cocktail party, just fan the straws out in tall water glasses or tumblers. 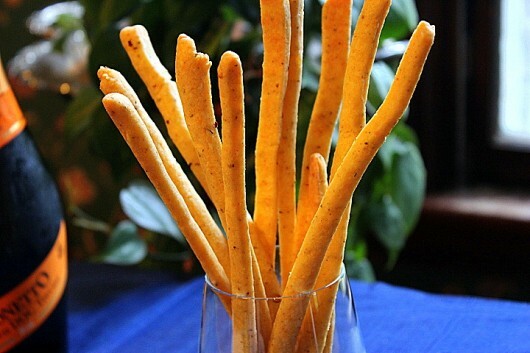 Folks, there isn’t a beverage in the world that doesn’t pair well with these slightly salty, slightly spicy, tender-crisp Herbed Cheese Straws. Promise me you’ll try them! Center the oven rack; preheat the oven to 400°F. 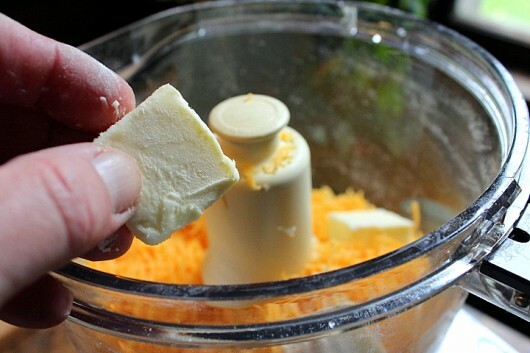 Tip the cheese, butter, flour, salt, herbs, and red pepper flakes into the bowl of a food processor. Pulse a few times, just to break up the butter. 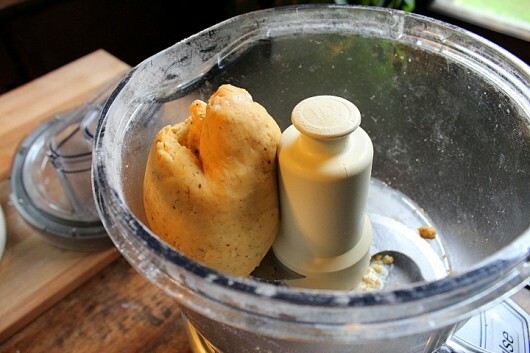 Then add the cream, and run the machine until the dough masses on the blade — 20-30 seconds. Dump the dough onto a lightly floured surface, and roll into a 10 x 8 rectangle, approximately 1/8-inch thick. 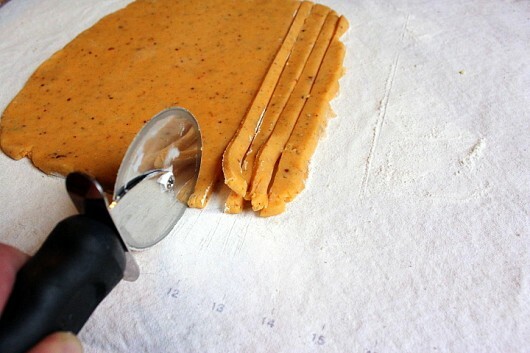 Use a floured knife or pastry wheel to cut the dough into 1/4- or 1/3-inch-wide strips. The strips can be as long or as short as you desire. Space the straws 1/4-inch apart on a parchment lined baking sheet. Bake until the ends of the straws start to color — 12-15 minutes. Transfer the baking sheet to a wire rack to cool. Serve at room temperature. Although the straws can be stored for up to 3 days in a sealed plastic bag, they will be better if served on the same day you make them. 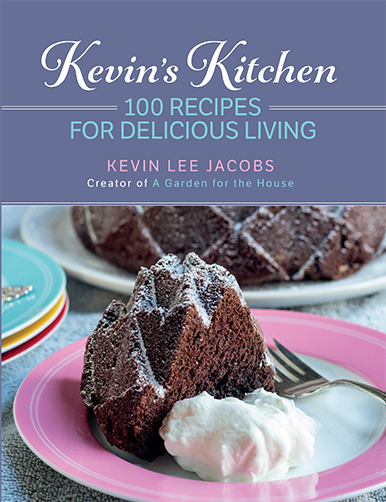 Don’t miss any of Kevin’s fun recipes and gardening tips…subscribe for email updates! I am DROOLING!!! Tomorrow has a rain prediction, perfect for staying indoors and making this sort of deliciousness. If I am able to practice a vestifge of self control to have enough left to share, the neighbors will love me. Hi Mary in Iowa – These are crazy-delicious. And yes, if you share them, your neighbors will love you! How yummy these are!!!! Buttery, cheesy and just a hint of a warm zing from the pepper flakes! The herbs add such an interesting earthy note..these are HIGHLY addictive!!!!! Crisp yet tender on the inside… like a savory shortbread! The ones I was treated to didn’t last long! Perfect for a mid day snack… and as Kevin said- very elegant (but easy1) to serve for guests too!!!! Thanks for sharing Kevin!!!. I couldn’t resist making these. I had all the ingredients so I made a batch. They are soooooo good and easy and delicious!!!!!! I imagine any dried herb would be good like you said Kevin. I enjoyed the herb de provence very much. If sharing with children I’d probably leave out the red pepper flakes. I will make this again and amaze my friends and family. Thank you for the awesome recipe!!! Hi Brenda – Thanks for taste-testing! 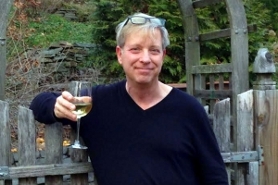 Hi Susan Knerr – So glad you tried — and liked — these yummy appetizers! oh yum! I am wondering if I dare to try making them using a GF flour. It’s always a bit tricky to play around with a great recipe. Made them today and they’re half gone already. Don’t think there will be any to share. This might be gluttonous behavior, but a hefty helping qualifies as a cheese sandwich for lunch, correct? Crazy delicious is right! Herbes de Provence gives them a unique and fun flavor. Thinking I might try them with dill the next time–and the next time may be tomorrow. Mary in Iowa – I know what you mean. These appetizers can disappear in a flash! It is the last straw, so to speak! 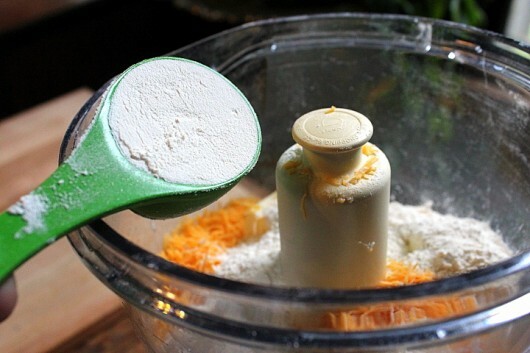 This recipe has convinced me finally to get a food processor. Those cheese straws look easy and delicious. I am going to make some today for no special reason except that I want some. Thanks! Torture! 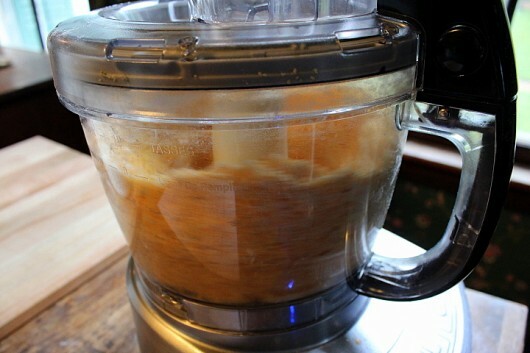 Just gave away our 220V food processor as I’m retiring and we’re moving home. Will have to wait til July to try this at home; it’s on my Google calendar to make for July 4! This will tie me over perfectly until the leeks, you inspired me to plant ,are ready. It was a tough week! Lots of work while the heart yearns to be in the yard! Its Friday! 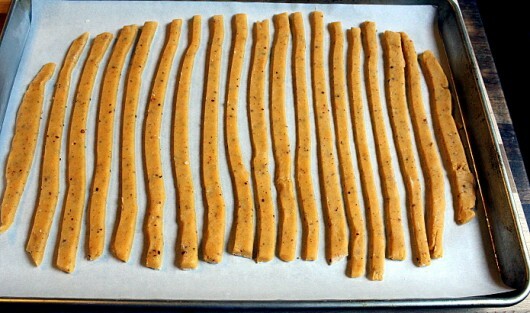 Cheese straws with wine will be perfect tonight to celebrate! Thanks for another creative idea! You must wake in the middle of the night to write down each epiphany as it dawns on you. Wonder if you could do these with mozzarella cheese? This is perfect for the graduation party this weekend. Thank you for the fun and classy recipe! The pictures are amazing – as usual. Your sense of humor is grand! 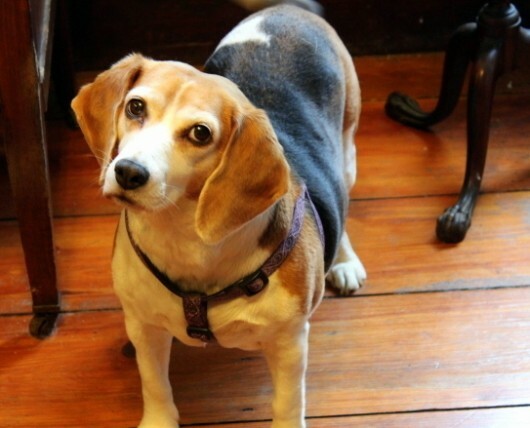 Lily – aww, she is just adorable! Uh oh! Easy, delicious and addictive. This could be trouble….the good kind. Thanks for another winner. And with the Lily seal of approval. Do you think these could be made using a dough hook? I’m bringing snacks for book club and these look like a perfect choice! These look YUMMY! What kind of pastry frame are you using? I’ve been considering getting one, and this recipe puts me over the top. Is the cloth in the frame or on the counter when you cut the straws? I can see these gracing the counter the next time our neighbour pops over for a “wine and whine”. These look amazing. I’m thinking of trying them with almond flour as I’m supposed to avoid wheat. [with all Kevin’s amazing recipes, I fail at that avoidance many times]. Can’t wait to try these! What is your floured surface? Love, love, love this site and everything on it. There is so much useful information here. I will definitely be trying these Cheese Straws. I use your Sourdough Boule recipe exclusively, Kevin. It took me a long time and a lot of rejects before I found yours and now I use it all the time. It’s hot and muggy, and I’m supposed to go to an Art Fair. 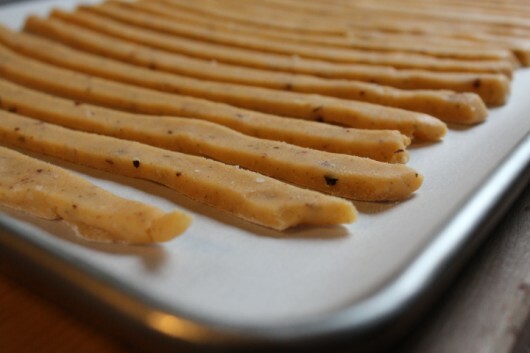 To heck with that, I’m making the herbed cheese straws for dinner instead. I can go to the Art Fair tomorrow! My mouth is watering just looking at the pictures. Way to go Kevin! I enjoy your weekly posting! How is Lucy doing? We don’t see her often. She is a little darling. Your almond cookies are fabulous. These look fabulous! Will be trying them this weekend. I have found some of my best “go to” recipes on your site and I’m sure this one will be added to the list! Wow Kevin, these are really simple and delicious! I love the zesty taste and it will go so well with a Pinot Grigio or a white wine spritzer with lemon and mint (for that matter, a gin martini : – ) ha-ha obviously I can’t wait to relax with my Johnny this evening out in the Zebo. 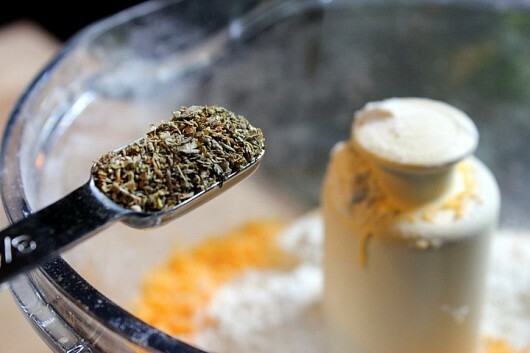 I did not have any Herbes de Provence, but substituted my own dried oregano, thyme, rosemary, and a little dill seed – it turned oput to be a wonderful combination. Thanks so much for always making me laugh and for sharing all the things I love in life! These look great and so easy to make, can’t wait to try them! the Bubble and Squeak! All were easy and delicious! Lots of fun. Thank you. Sounds sooo yummy, salivating while reading your instructuons. These were the best! What a quick and easy thing to whip up in the afternoon to have ready for the slightly after five crowd. Everyone raved! Filing this away. I know I will make these soon & curse you after I eat the whole batch myself 😉 Your blog photography is looking great these days! New camera? These sound absolutely amazing!!! I adore cheese and can picture myself eating all of them, by myself! MMmmmmmm. These look easy and delicious. Much nicer than the ones you have to twist and then they straighten out in the oven. I hope you dropped some cheese for Miss Lily. Can you say, “Book Club!!”? I guess I’ll have to have a cocktail party so I can have some. No one should eat cheese straws alone. I have never ever liked cheese puffs or anything related to them. THIS, however, seems to be so different I’ll have to try them. Thanks for the recipe, Kevin, and the pictured tutorial. Again, another great recipe! Thanks Kevin. 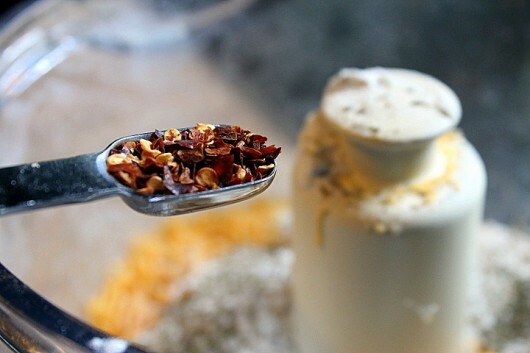 Have you tried Aleppo Pepper Flakes yet? They are my newest obsession. I will never use regular red pepper flakes again. They are not in grocery stores (not in this small southern town anyway) but are available online. Every member of my family that has tasted anything I’ve cooked with them have ordered some. This may be my next recipe to try Aleppo in. Looks great Kevin, can’t wait to try them! All the best from Australia – can’t wait for your cookbook! Have you.ever tried other types of cheeses? My husband doesn’t like cheddar cheese. Hi Carol – I always make these straws with Cheddar. But you could always substitute Swiss cheese. Give it a go, and let me know how the flavor works out for you! Hi Brandon. Well, that is what I would do. And I’d eat every single cheese straw just to make sure. Enjoy! Thank you, Kevin! Will definitely try these. Your step-by-step photos in all your recipes are so helpful! Def going to try this this w/e! I would love it if someday you could give tips on throwing a great cocktail party, like how you set up a guest list so it flows happily, how you choose what to serve, who makes the cocktails, music? Etc!!! I SO want to throw one but am very nervous! Thanks for everything Kevin! Thank you Kevin for your very generous sharing. Can’t wait to try all these recipes out. I’ve made your recipe before. Husband loves them. Think I’ll make some for New Year’s day. I’m just fixing a few appetizers for watching the football games. this sounds like a perfect snack – and great to take to a retirement party. I sure need a food processor! too many great sounding recipes that I’ve been missing out on! All toooooo funny, ” hoh them all to myself”. Happy New Year Kevin. I’ve been making these since you first published the recipe. However, every time I look at it, it makes me laugh when you say “real cheddar cheese” when what you mean is processed American cheddar. I’ve used both (bought the American one as an experiment) and believe me, they’re superior when made with REAL cheddar cheese – cloth bound from the Cheddar Gorge area of the UK. They’re also better when made with Australian tasty cheese, which is what I usually use. That approximates the UK style and is not a processed cheese. A bang of the drum for REAL cheese. These sound wonderful! Thanks and happy New Year from Texas!